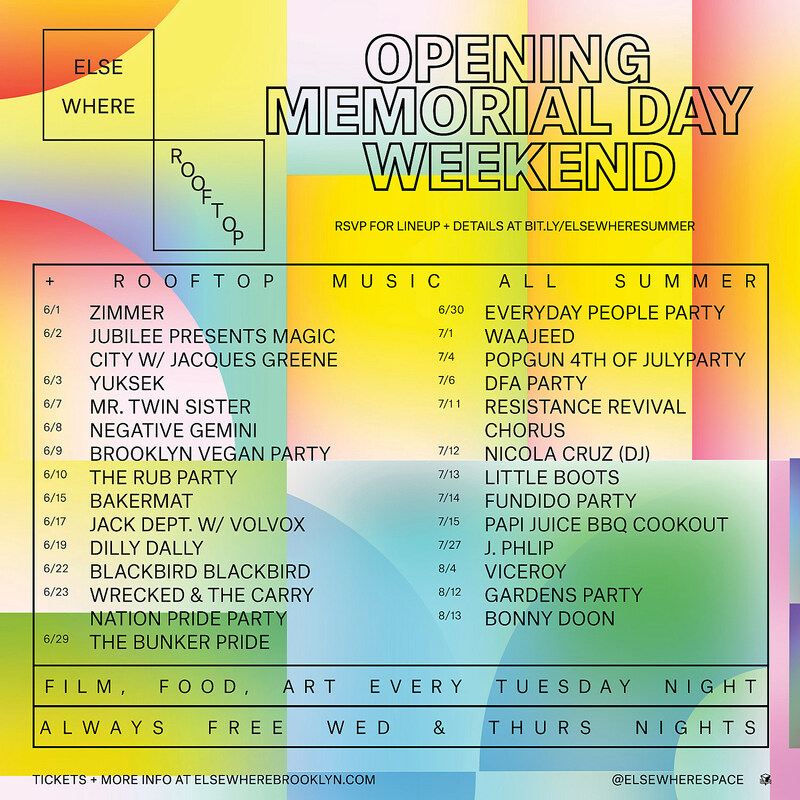 Popgun’s Bushwick venue Elsewhere is getting set to open its rooftop venue and bar on Memorial Day Weekend, and their summer schedule has been announced, including Yuksek (6/3), Mr. Twin Sister (6/7), Dilly Dally (6/19), Pride Weekend parties on 6/29 and 6/30, a DFA party on 7/6, electronic pop artist Little Boots on 7/13, and Detroit indie rockers Bonny Doon on 8/13. We’re also excited that the BrooklynVegan Northside party on June 9 (with Deerhoof, Protomartyr and lots more TBA) will also take over the roof as well as the rest of Elsewhere (tickets). The Memorial Day weekend events have yet to be revealed but Elsewhere says it will be “a long celebration with live music, DJs, BBQ, frozen drinks and surprises.” You can RSVP now. Rooftop Tuesday Nights will highlight film, food and art; and Wednesday and Thursday nights on the rooftop are always free. Tickets for most rooftop events are on sale now and the full announced schedule is listed below.